Brace yourself for the Extended Edition of Taken 2, with even more explosive action and thrilling suspense - plus in-depth extras that take you deep behind the front lines of a one-man war. Liam Neeson returns as Bryan Mills, an ex-CIA operative who finds himself "taken" hostage along with his wife. To survive, Bryan must enlist the help of an unlikely ally and use his brutally efficient skills to take out his kidnappers. Special Featu..
Liam Neeson stars in this action-packed thriller that will have you on the edge of your seat from start to finish. 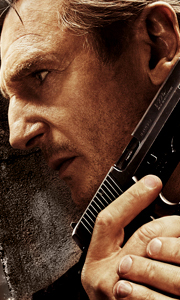 When his daughter is kidnapped in Paris, a former spy (Neeson) sets out to find her at any cost. Relying on his special skills, he tracks down the ruthless gang that abducted her and launches a one-man war to bring them to justice and rescue his daughter. Special Features Six Inside Action: Side By Side Comparisons, Making..
Liam Neeson stars in this action-packed international thriller that will have you on the edge of your seat from start to finish. When his estranged daughter is kidnapped in Paris, a former spy (Neeson) sets out to find her at any cost. Relying on his special skills, he tracks down the ruthless gang that abducted her and launches a one-man war to bring them to justice and rescue his daughter. Special Features Making Of, Avant Premiere, ..
Taken: Liam Neeson stars in this action-packed international thriller that will have you on the edge of your seat from start to finish. When his daughter is kidnapped in Paris, a former spy (Neeson) sets out to find her at any cost. Relying on his special skills, he tracks down the ruthless gang that abducted her and launches a one-man war to bring them to justice and rescue his daughter. Hitman: Hitman too extreme for cinema, roars to..
TAKEN: Liam Neeson stars in this action-packed international thriller that will have you on the edge of your seat from start to finish. When his estranged daughter is kidnapped in Paris, a former spy (Neeson) sets out to find her at any cost. Relying on his special skills, he tracks down the ruthless gang that abducted her and launches a one-man war to bring them to justice and rescue his daughter. TAKEN 2: Liam Neeson returns as Bryan..
Liam Neeson returns as Bryan Mills, the ex-CIA operative who stopped at nothing to rescue his daughter from sadistic kidnappers. When the father of one of the kidnappers swears revenge, it is Bryan and his wife who find themselves "taken" hostage in Istanbul. To survive, Bryan must enlist the help of an unlikely ally and use his brutally efficient skills to take out his heavily armed foes one by one. Special Features Extended Harder Cu.. The hunter becomes the hunted when Liam Neeson returns as former CIA operative Bryan Mills, whose finds himself framed for the brutal murder of his ex-wife (Famke Janssen). Consumed with rage and pursued by a savy police inspector (Forest Whitaker), Mills must rely on his “particular set of skills,” one last time to find the real killers, clear his name and protect the only thing that matters to him now – his daughter (Maggie Grace). S..
Liam Neeson is the ultimate triple threat in the adrenaline-pumping Taken trilogy! Delivering explosive, unforgettable performances as Bryan Mills, a former spy possessing "a very particular set of skills acquired over a very long career," Neeson raises the bar for the action-film genre with three full-throttle thrillers that have captured the imaginations of audiences around the world! Taken - When his estranged teenage daughter (Maggi..
Own Taken Season 1 DVD from Deff, DVD, Blu-Ray & 4K Video Specialists - Free UK Delivery..